The above Royal Mail 700th Anniv. 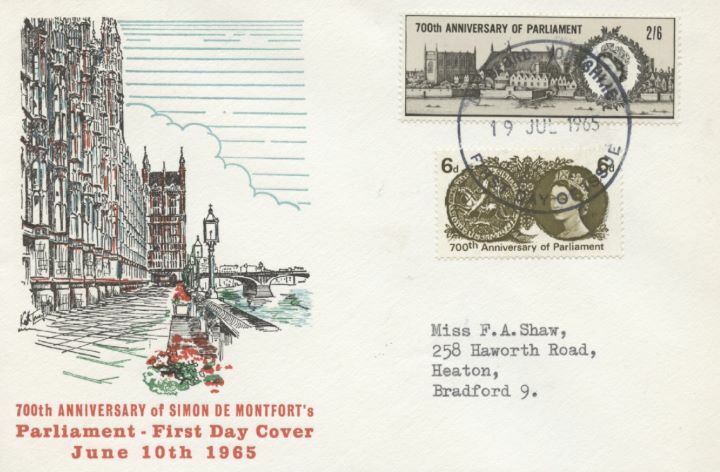 of Parliament stamps were issued on 19 July 1965 by Royal Mail and feature the following stamp designs: 6d De Montfort's Seal; 2s 6d (non-phos. only) Parliament. The Parliament first day cover with the Bradford FDI Postmark postmark has been produced by Rembrandt and features these stamps which can make a very collectible and lovely gift.